Where are you again? My own mother keeps forgetting the exact country, but when I remind her we’re in the region of Transylvania, that rings a bell. It seems that to a lot of people, to travel to Romania is to go seriously off-the-beaten-path destination. I think that must be the case, and although I know plenty of travel bloggers who’ve been here, it still seems like an undiscovered travel spot for most. For us, that is awesome, and it could be for you, too, if you visit soon! We’ve been in Romania for about a month now and are loving it. (Fall/winter 2016). 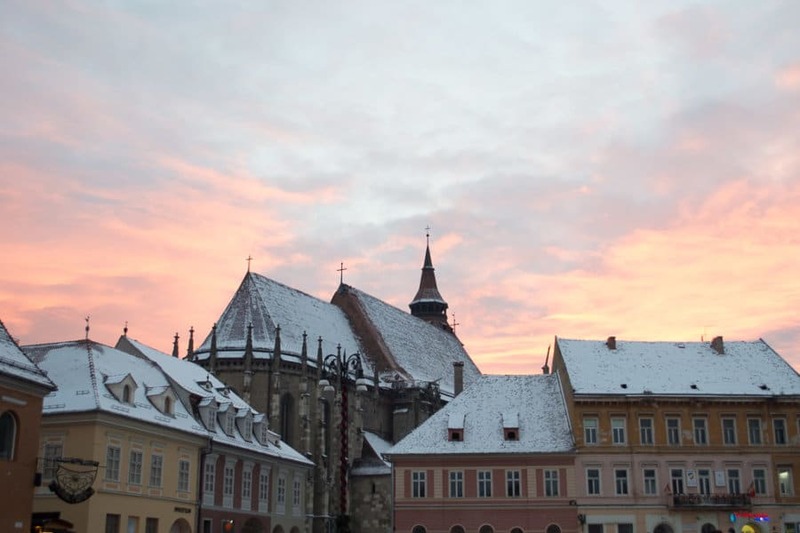 We hope to see more of it, including Sighisoara, Sibiu, and Timisoara. Honestly, there are so many amazing spots to be discovered (check out this list of the most beautiful places in Romania). Our first week or so was spent in a remote village called Baita towards the north. We stayed in an AirBnb there which was great. Really loving AirBnb for this trip. 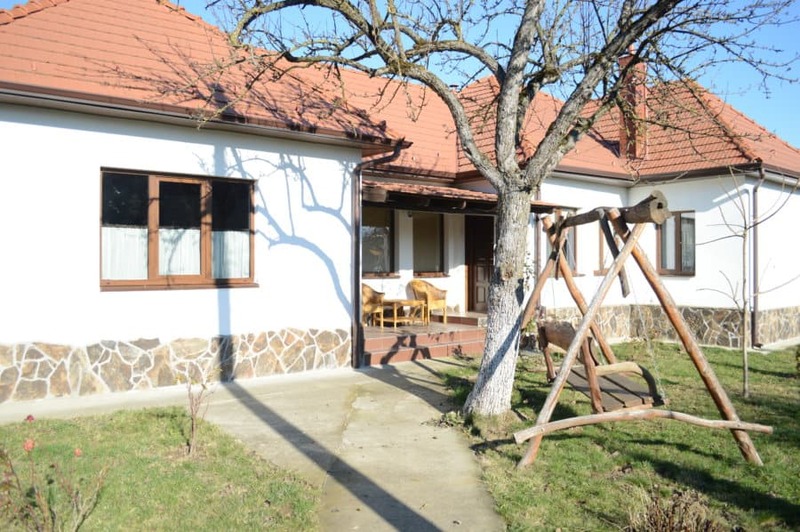 We had a whole country home to ourselves for about $15 per night, with fast Internet and good heating. The house was right on the main street of the village, which despite its unpaved roads and modest buildings, had surprisingly more residents than one might expect. The chickens, however, definitely outnumbered the citizens. There were animals everywhere, which Nathan and I loved. 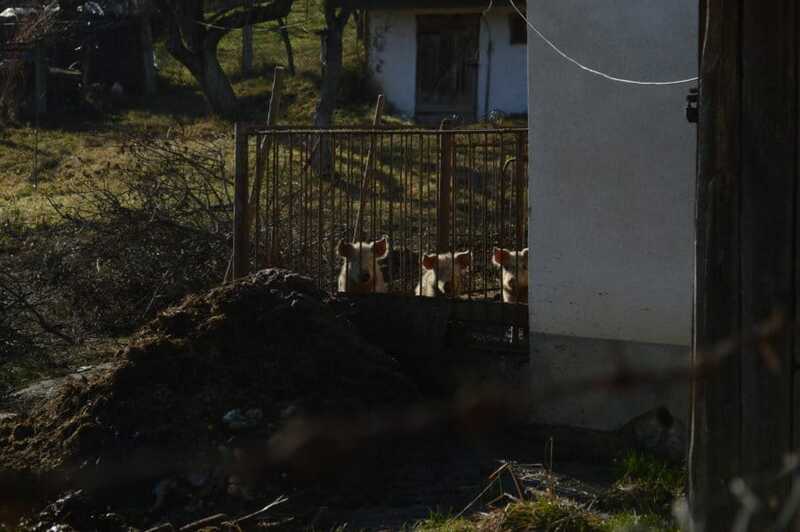 It makes us happy to see cows, dogs, cats, pigs, and sheep on a regular basis. These were all in abundant supply in Baita. And we weren’t the only happy ones, either. 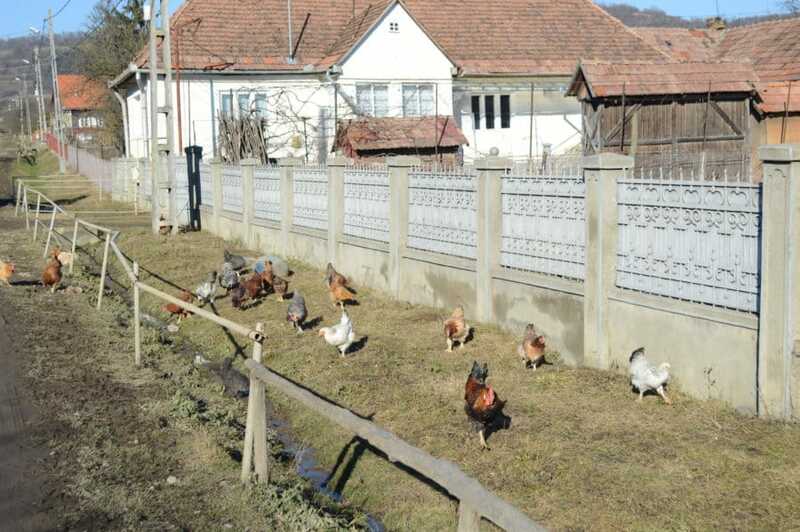 The village’s residents seemed very content, glad to live a very rural, community-based life in the Romanian countryside. It was nice to see such simplicity—a welcome break from the hustle and bustle of big cities, and even from the craziness of the airports we frequent. Yes, remote Romania is a wonderful spot to get away from it all. Baita was really lovely. Out the window we could see horse drawn carts clip-clopping by, the town dogs boisterously racing along behind them. 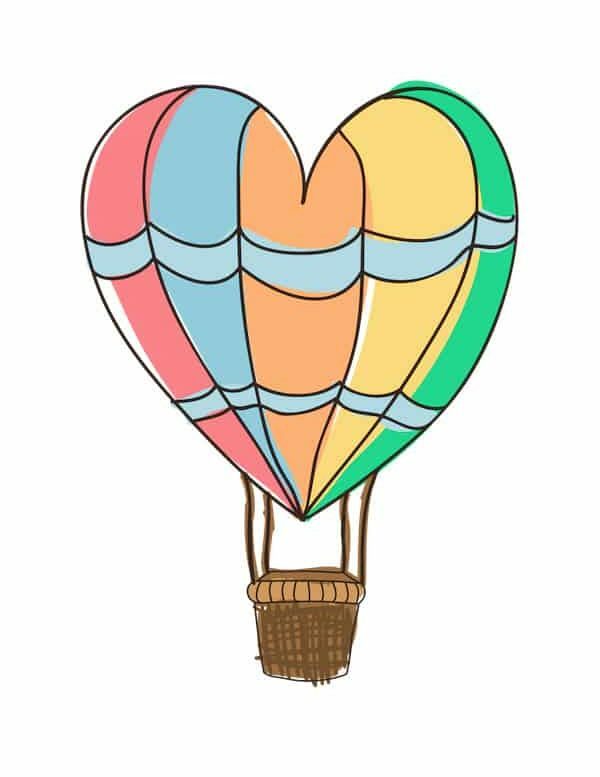 When we went for a walk, old ladies dressed in traditional garb peered at us from behind their gates, waving and smiling. Ad the church across the road from our AirBnb broadcast its services over loudspeaker, several times per week. It was definitely an experience we’d never had, and we were ultimately glad we started our Romania trip there. However, we soon realized that maybe it was a little TOO remote for us. You’d think we’d be pretty experienced travelers by now, but nope, we still make rookie mistakes. Our first mistake was bringing far too little of the Romanian LEI, the local currency, along with us. We’d spent more than we reckoned, too, on the train-bus-bus ride required to get to Baita. By the time we arrived, we were no longer flush with cash. The village had a local store, which I patronized on our first morning there. I did not spend my lei well. In this little shop, almost everything was set behind the counter, so you had to ask for each item from the store clerk. Did I mention that essentially no one in the village spoke English? Oh, yep. Not a surprise in a rural town, but a fun challenge we had to embrace with open arms. I came back from that first shopping trip with a sticky pastry, a package of unnamed meat products, a loaf of bread, a container of either cheese or butter—still not entirely sure which, and two apples. All that set me back just a few dollars, but in LEI terms, it was already most of our money. No worries, we reasoned, we could make it til the weekend when we’d grab the bus into the big town 20 minutes away. Then we’d stock up on necessities. Yet on Saturday, we were out bright and early to catch the bus and quickly informed (with much gesturing and the use of Google translate) that there was no bus on the weekend. Welp. Instead of going to town that day, we spent the near remainder of our cash to get some more food at the store, saving just enough to pay for the bus come Monday. In the end, I had to go into town on my own to find an ATM. We only had enough left for one bus fare. On the plus side, we lost some excess weight during our week of semi-fasting. We also became very skilled in some basic Romanian, even communicating with the sweet older lady Amelia who sold us some potatoes and raw milk (still warm and fresh from the cow’s udder). Finally our time to depart Baita came, and we (with difficulty) figured out the train times for how to get to our next spot. The online information for public transport in Romania is somewhat lacking, and what information there is often is incorrect, so it is best to arrive early and ask in person when unsure. From the town of Reghin we got a bus south to Brasov. In many ways, it was pure chance that determined our destination. 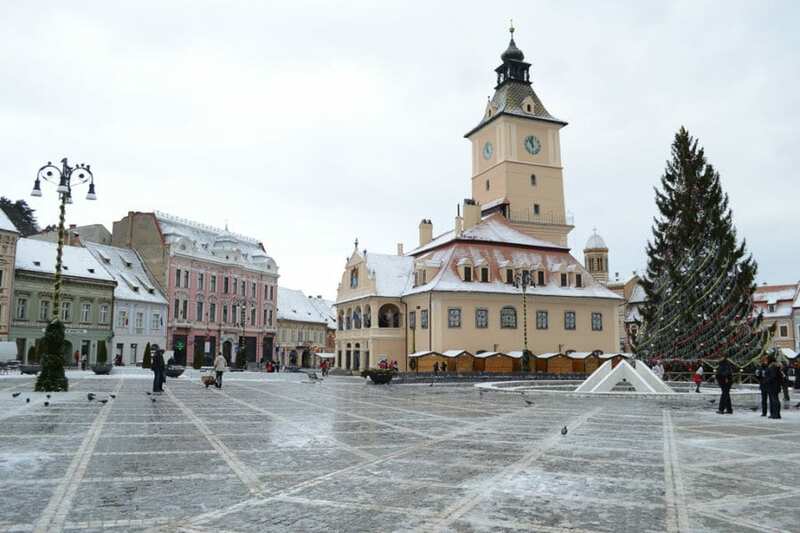 Originally, we had researched and chosen the city of Sibiu as our potential base in Romania, but because of our rough rural week, we were desperate to get to a city again, and Brasov was the shortest and most direct train ride. But oh, I am so glad we ended up in Brasov, because it is awesome. Transylvania was always our region of choice, boasting mountains, castles, and historical cities, and Brasov is the most well known of those. 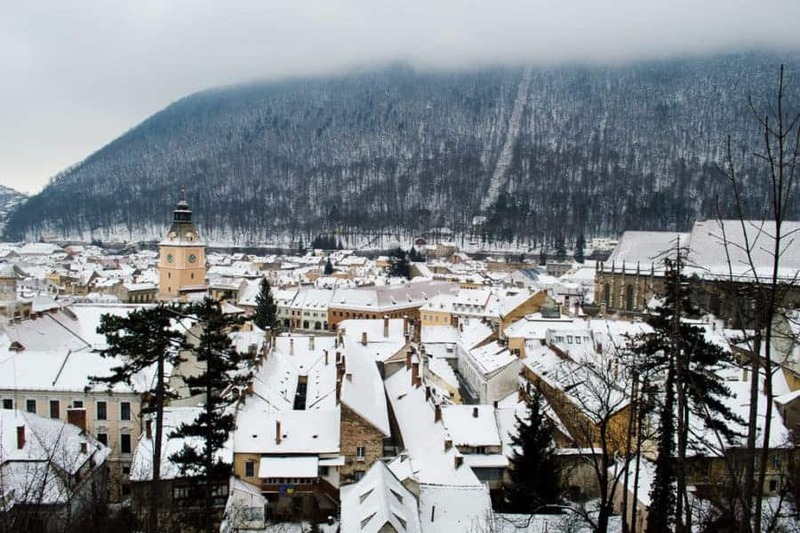 Brasov: Sweetest City in Romania? Okay, we haven’t yet spent time in any other cities in Romania yet, so this is inherently super biased, but I am just in love with Brasov! I can see why it’s one of Romania’s most popular and well-known tourist destinations. The proximity of Bran Castle (“Dracula’s Castle”) is one major attraction, but on the whole, this city is just so perfectly quaint. It’s also an easy day trip from Bucharest, the country’s capital. The Old Centre is where the most beautiful streets and lanes are to be found. If you like cobblestones, red roofs, and a sizeable, yet cozy city, Brasov will delight you, and the Old Centre will be your top spot. Being here in the winter adds a magical touch, too, with snow sticking picturesquely to the shingles and plenty of holiday lights aglow. 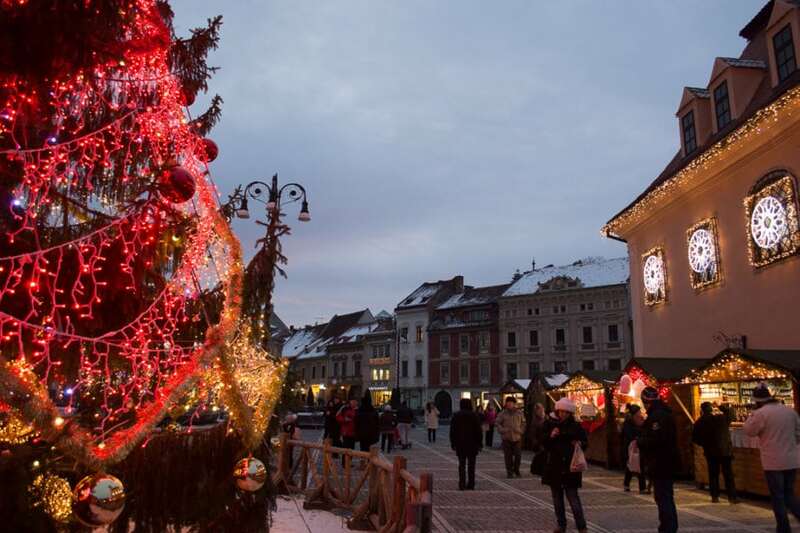 Not to mention the wonderful Christmas market that fills the main square, the Piata Sfatalui, with its hot wine (vin fiert), crafts, and tempting desserts. 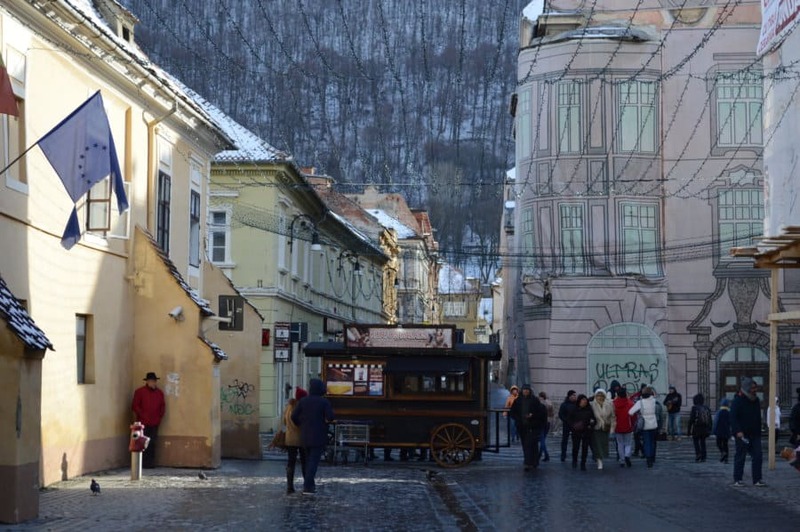 Brasov has an old world feel but there’s plenty to do and see that is modern, too. Most people speak English fairly well, so we’ve lost the need to use Google translate (but we always say Hello and Thank you properly–buna ziua and mulțumesc). 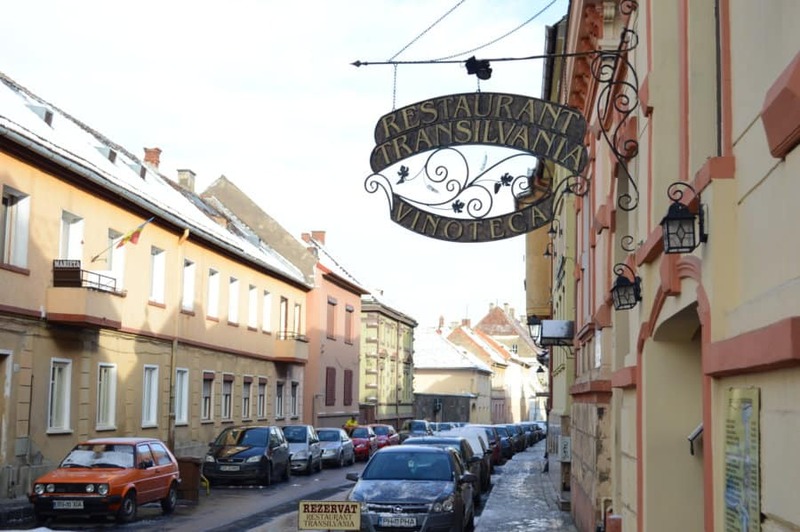 There’s lots of shopping along the streets leading away from the Centrul Vechi (Old Centre) and certainly plenty more in the rest of Brasov. Last week, we took a bus ride to the big mall in Brasov, the Coresi Shopping Resort. If not for the Romanian signs and items, we could have been at any mall in North America, or many places elsewhere. One of the best parts of traveling in Romania—and part of why we decided to come and spend 2 months here—is its affordability. While Western Europe has a reputation for being a pricey region, Eastern Europe tends to be known for its budget-friendly destinations. Romania absolutely fits the bill, and would be an awesome choice for any traveler on a backpacker budget. Currently, 4 lei is around USD $0.93 and we’ll show you what that equates to for your travels in Romania. To be frank, we haven’t investigated hotel and hostel options too closely, but for our style of slow travel, we often choose AirBnb. 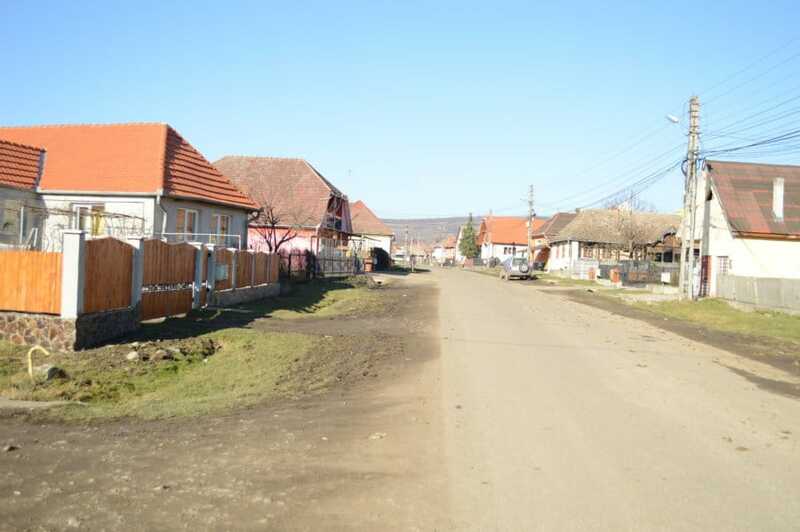 This is an ideal option for Romania as there are plenty of properties and the prices are great. 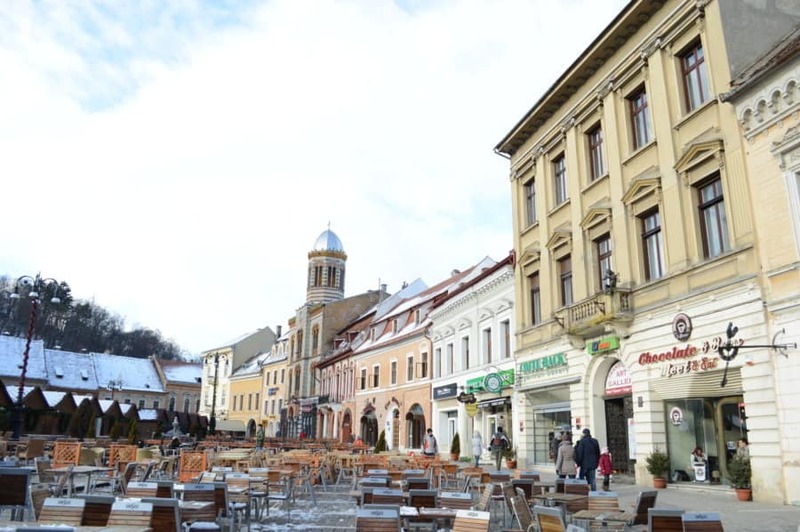 You could spend $40/night on a fully furnished, centrally located apartment in the centre of Brasov. If your budget was higher, you could live even more regally. Alternatively, one night in Edinburgh, Scotland would run you $99+ for the same type of property, and it likely would not be nearly as well-located. If you’re staying somewhere for longer, you can often get a significant discount for a weekly or monthly rate. That’s what we are doing here at our studio apartment in Brasov, and it could not be more perfect for our needs. Clothing seems to be almost as expensive as elsewhere, so that hasn’t made much of a difference in our budget. We stocked up on warm sweaters and coats at UK charity shops, too, so we’re not needing to buy any clothes currently. Where Romania really rocks is the price of food and drink. In many destinations, those costs are the sneakiest way to drain your budget fast. One of the ways we keep our costs down when traveling together is to avoid eating out as much as possible. We are still doing that now because it’s definitely the cheapest and healthiest option, but here in Romania, we can go out once or twice per week and not feel guilty about overspending! A typical dinner out with drinks runs us around 60-80 lei or $15- $20. We can easily keep it to $15 if we don’t have any wine, beer, or cocktails. That price is a dream! And as you might know, we really, really love to work in coffee shops. It’s kind of our thing, and a digital nomad essential. Well, the days of $6 lattes are consigned to the past. Here, we spend no more than $2-3 on a coffee beverage (between 7-13 lei), and our bill is often $5 between the two of us. You might not find that to be incredibly cheap, but it’s a game changer for us. Our daily expenses are essentially cut in half. Combine that with shopping at the grocery store (we’re probably spending less than $80 per week) and you have a recipe for a really affordable way of living. Certain items are incredibly cheap. A bag of apples for less than $0.75, milk for under $1, hummus for $1…you get the idea. It’s so nice feeling more on top of things with these lower prices. We can’t wait to share more from our time exploring Romania. There will be plenty to come on Brasov and its surrounds, and hopefully other destinations we see as well. But at first impressions, Romania is safe, easy to manage (especially in the cities), and has friendly people. 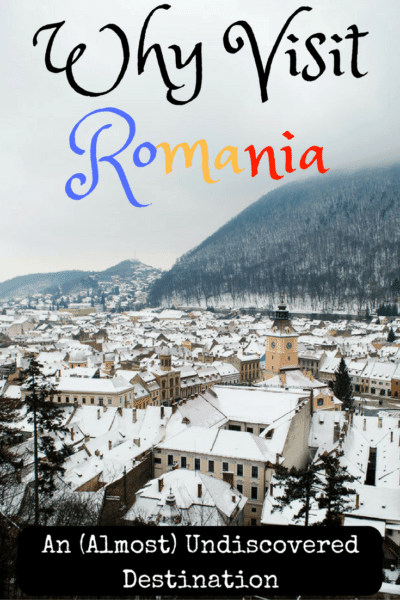 We hope this can serve as a brief travel guide to Romania, or at least an introduction, intriguing you to visit an amazing place. I recently spilled every single coin out of my purse in line for the grocery store and a nice young man bounded over from the next queue to help me gather it. “Where are you from?” he asked. “America,” I answered, while laughing and apologizing over the endless coins on the ground. He was so pleased to meet me he said, and I heard him excitedly tell his friends I was from America. Since I have yet to encounter any other Americans during our visit to Brasov, I only hope I represented us well, spilled money and all!! Great post Amy, and I would love to visit it someday. I have planned to go there in 2016 but somehow I had to change my mind.Transylvania is always a place I wanted to visit and see the Dracula’s Castle. I heard great things about Brasov. yes, it’s lovely here! hope you get a chance to return. thanks for your comment! Hi Amy! your “adventures” in Baita were a fun read, but it’s nice to experience a simple life in the rural areas, isn’ t it? It’s true, Romania is very cheap destination in terms of food and drink and the prices for accomodation are also quite afforadble. I would say that everything else is the same, so it’s not like you can make a plan of going on shopping sprees. It’s perfect for those who simply want to discover new places and learn more about different cultures. so true, Luminita! We’ve really loved our time here, and Baita was a great experience, although we should have planned better hehe. Yes, we’ve gotten so spoiled by the great low prices for food. Going back to the USA in two weeks is going to feel very expensive! Thanks for your comment! The best way to visit Romania is a Dracula tour on Halloween with at least one Halloween party included. A tour named “Halloween in Transylvania with Vlad the Impaler” was placed by the prestigious Fodor’s Travel Guide in Top Ten Must-Do Adventures.